While we’re not sure if Walt would approve, it sure seems like the internet does. Disney’s Aladdin is set to release on May 24, 2019. 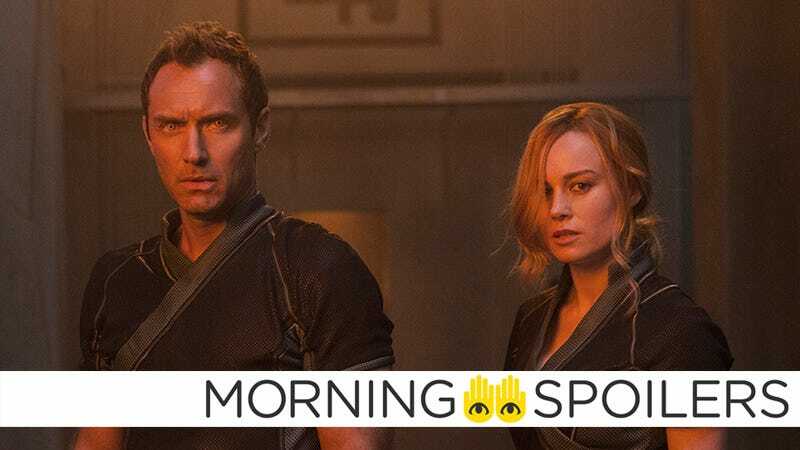 Jude Law and Brie Larson as…two people who star in Captain Marvel. Fortunately, a new image from Fandango substantiates the rumor. Elsewhere, promotional art for the full Starforce team has surfaced online. The Mr. Rogers biopic starring Tom Hanks is now officially titled, A Beautiful Day in the Neighborhood, according to Deadline. I think they’re gonna be simultaneously sad and satisfied. It’s hard not to get a bit kind of wistful, a bit melancholy. You know, I auditioned for this movie when I was shooting a movie called Tropic Thunder… There’s very few things I’ve done for this long. I’ve been a son for 36 years. Been an actor for 20 some odd [years]. [I’ve] never played a part for as long as I played Hiccup. So it’s gonna be [melancholic] to say goodbye. Hellboy asks Ian McShane about the Deadwood movie in a new image from Empire Magazine. Empire also has a new photo from Shazam’s first meeting with Dr. Thaddeus Bodog Sivana. Elsewhere, a new behind-the-scenes photo sees Shazam getting serious at the carnival. Fandango has the first set photo from the Scary Stories to Tell in the Dark movie. Fandango also has a new image of John Lithgow as Judd Crandall. Danny DeVito monetizes his elephants in a new photo from the Dumbo remake. Princess Jasmine speaks with the Sultan in another new photo from Fandango. The Beast scares the hell out of the cops in the latest photo from Glass. We also have another new image of Dame Judi Dench as Commander Root. The Weeping Woman catwalks down a spooky attic in the latest photo from The Curse of La Llorona. Coming Soon has four new character posters from Joe Cornish’s Arthurian family film. A new trailer dropped yesterday, here it is in case you missed it. Not to be outdone, Bloody-Disgusting has a poster for the experimental Black Mirror movie just in time for today’s release. Bloody-Disgusting also has a poster for the third season of Slasher, the horror anthology series from Degrassi: The Next Generation creator, Aaron Martin. Finally, a new behind-the-scenes featurette for Deadly Class teams up with Henry Rollins to finish off 2018.